According to a report by The National Golf Foundation, the golf industry had a very good year in 2018, with participation up for the first time in 14 years despite a small drop in the number of rounds played (weather was the main culprit). Perhaps most impressive for the game’s future health is that 2.6 million people joined the ranks of golfers; it was the fifth straight year of more than two million new golfers. The summary of the report emphasizes Tiger Woods’ impact on the sport. His comeback from back surgery in 2018, according to NGF, contributed to “a surge of interest and a ratings jump of almost 30 percent for televised tournaments in which he played.” One can only imagine the kind of effect his stunning victory on Sunday at The Masters will ultimately have on the 14 million people who say they would like to play on a golf course. This is all good news, but in golf, as in life, one hand giveth and the other hand taketh away. For example, a new report from the golf industry observers at Pellucid, a well-respected consultant group, indicates that, “as great a story as [Tiger] is, it doesn't materially impact the golf industry operations world…and likely also doesn't meaningfully impact either player development or increasing involvement.” Talk about raining on the parade. Of greater potential impact, according to an article in today’s Wall Street Journal’s Greater New York section, is that proposed legislation in New York State could whack New York golf courses with a tenfold increase in property taxes. The legislation would permit a golf course to be taxed at a market value as if it had been developed with housing or some other commercial venture. One of the venues challenging the state legislature’s move is President Trump’s Westchester club, whose market value is $14 million (never mind that Trump himself has testified publicly that it is worth $50 million). One of my favorite public golf courses is Copake Country Club in upstate New York, about a 90 minute drive from my Connecticut home. 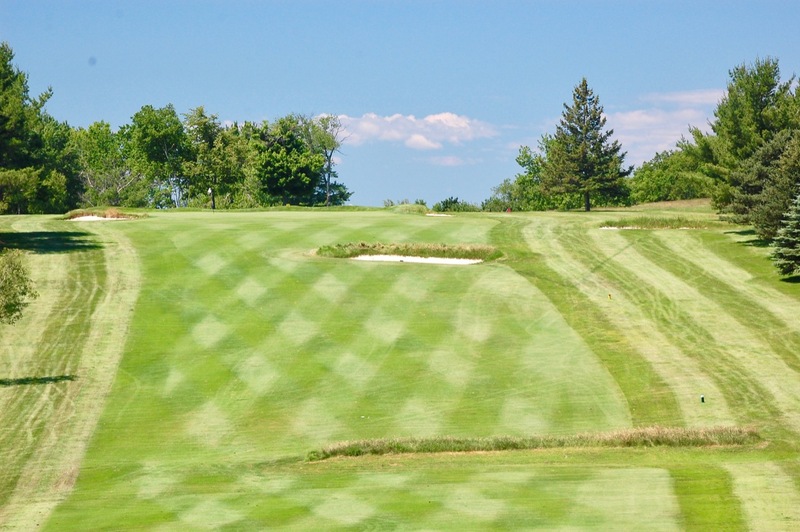 Proposed legislation in New York state could force Copake to raise its reasonable green fees. Or worse. Hardest hit by the new taxation would be public golf courses owned by private parties. These courses, many of them owned by families over two and three generations, survive (barely) on tight margins and are always at risk of weather problems and other factors that affect the conditions of their layouts. Many of them teeter on the edge of extinction, and developers are salivating over the prospect of cheap acquisitions of 100+ acre plots upon which to plop houses. Tiger Woods may help bring more people into the game, but the industry needs to have healthy, well-funded and well-maintained golf courses to welcome them. The betting here is that reason will prevail in most state legislatures where many senators and representatives are members of their local country clubs and will surely make the case that property taxes on golf courses are already high enough. Many of us will look on with awe tomorrow (Sunday) during the final round of The Players Championship at TPC Sawgrass when players in competition for victory face the daunting 17th hole with its tiny island green. That green is on my bucket play list, but I have played a par 3 surrounded by marshland maybe 100 times that is every bit as intimidating. 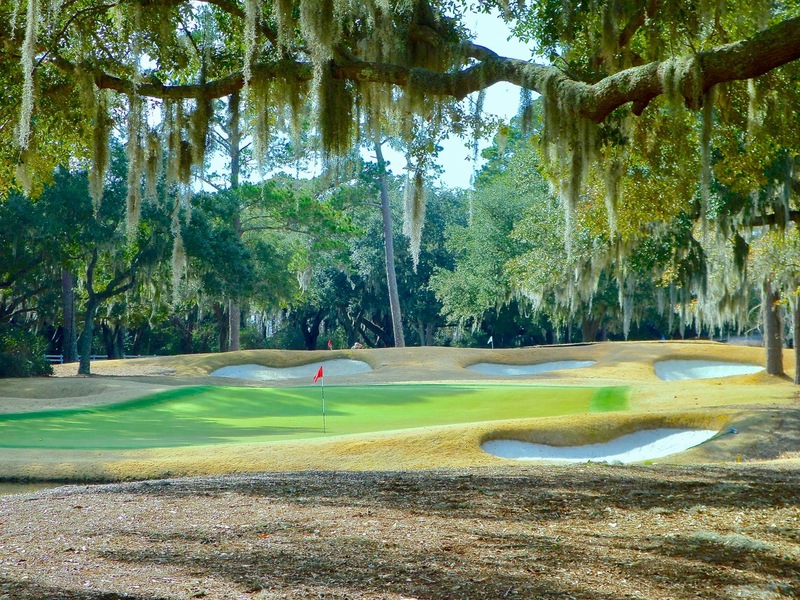 Although from all appearances, the 13th green at Pawleys Plantation Country Club is smaller than the 17th green at Sawgrass, published measurements indicate it is a couple hundred square feet larger. But I can't imagine the Sawgrass hole is any more intimidating than Pawleys short par 3. Jack Nicklaus took care of that in 1988 when he used the old rice plantation dike as the site of the four tee boxes on the hole. (The dike also serves as the tee locations for the longer and hardly less intimidating tee shot to the par 3 17th hole.) At only ½ mile to Pawleys Island Beach and the Atlantic Ocean, the tee-to-green shot over an expanse of marshland is fully exposed to the elements. Rare is the day when the wind is not blowing one way or the other and, oddly enough, the only “good” wind on the hole is straight in your face because the extra lift of a decent shot will pretty much ensure your ball does not bounce over the typically firm green. The toughest wind is the one that blows out across the marsh to the island and ocean beyond. The 13th green at Pawleys Plantation. Tee boxes are off to the left and, on the day of this photo, the wind was blowing from tee to green, making a difficult shot almost impossible to hold on the tiny green. That said, a shot to the back of the green under such conditions leaves a strongly downhill putt with the wind blowing back toward a middle or front hole location, running the risk of putting the ball through a thin strip of collar and into the marsh short of the green. Whereas the entrance and exit to the 17th green at Sawgrass is from the back left, at Pawleys the route is from the right, providing a dubious bailout that is no more accessible than the thin runway at Sawgrass. I am sure those who have played #17 at Sawgrass have their pet names for the hole, some not so genteel. At Pawleys Plantation, members like myself have a stock response for first-time visitors who stand on the 13th tee box, mouth agape at the shot before them. For months, rumors have been strong in and around the Cliffs communities in the Carolinas that South Street Partners, the firm that owns the amenities at Kiawah Island, were negotiating to purchase The Cliffs from Arendale Partners. An agreed-upon deal was finally announced late last week. No financial terms were disclosed. The deal was announced separately by both Arendale and South Street. In their announcement, the new owners indicated that "we acquired all Cliffs Land Partners and Cliffs Club Partners entities previously owned by Arendale Holdings Corp...South Street will oversee the development, management, operations, sales, and marketing for The Cliffs." The 50 year old South Street Partners maintains more than $1 billion in assets under management and is headquartered in both Charlotte, NC, and Charleston, SC. If they work their magic at The Cliffs as they have done at Kiawah, which they purchased in 2013, Cliffs owners can look forward to enhanced real estate values and a continuation of top-drawer club amenities. "Since acquiring Kiawah Partners, the master developer of Kiawah Island, SC, in 2013," the South Street letter to Cliffs owners indicated, "median pricing of properties within the community has increased significantly, new home construction is at an all-time high, inventory levels have decreased to the lowest levels in over a decade and sales have topped $1.5 billion." Prior to Arendale taking over at The Cliffs, the deluxe group of communities had something of a topsy turvy history. 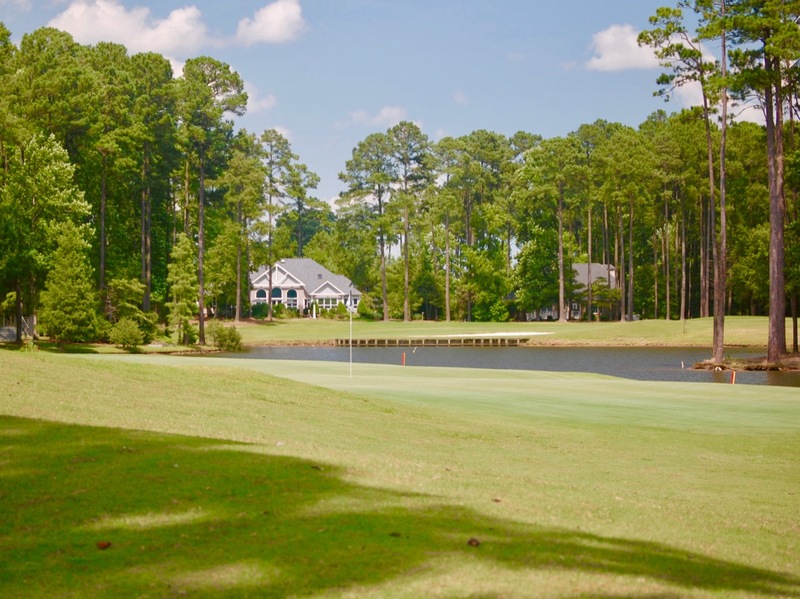 Jim Anthony acquired thousands of acres of land in the upstate region of South Carolina and began to build high-end golf communities that attracted well-to-do buyers from the Atlanta area and elsewhere around the country. Drawn by the luxury nature of the amenities Anthony installed inside the gates of the multiple communities -- an equestrian center here, a wellness center there, and beautifully groomed golf courses everywhere -- buyers signed up for club memberships that, at one point, required an initiaion fee of $125,000. Membership was mandatory at the point of property purchase; if you did not choose to join the club, you were not permitted to join it at a later date, and anyone interested in buying your lot or home at a later date could not join the club. Anthony ran into financial trouble just before the recession started in 2008. A project to build another Cliffs community featuring Tiger Woods' first American design was scrapped as the Anthony real estate empire began to unravel. After a Texas couple, residents of The Cliffs, stepped in with some temporary life-saving injection of cash, Arendale and others combined to purchase some acreage and the amenities, including the golf courses. A new purchaser must still sign up for membership within a few weeks of closing, but joining fees are now a much more reasonable $50,000, not outrageous when you consider the six clubs and the high standards of maintenance at each. Given South Street's record at Kiawah, we should expect a continuation of those high standards and, at least, some initial investments to enhance the quality of The Cliffs experience. If you are interested in more information about The Cliffs or an introduction to a professional agent who can provide you with a tour of any of the communities, please contact me. 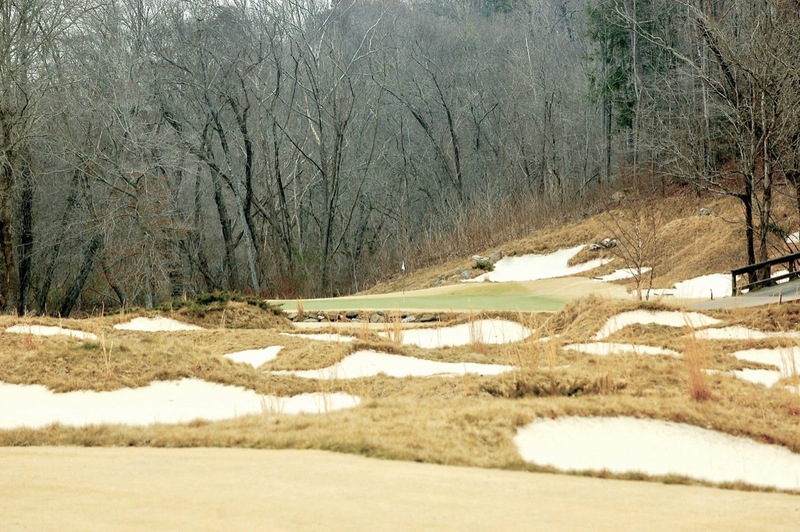 Gary Player did an excellent job of shaping the Cliffs at Mountain Park course in Travelers Rest, SC, not far from the popular city of Greenville. It is one of the half-dozen layouts included with a Cliffs membership. 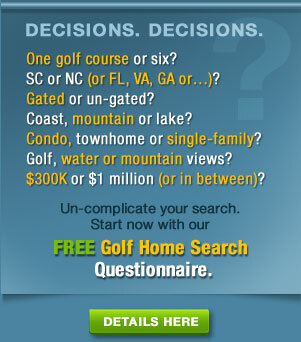 Golf Community Reviews is my day job, but every couple of months I moonlight for CarolinaLiving.com, where you will find a few dozen articles you have not read in this space, all dedicated to the golf life in the Carolinas. A few of those articles may seem familiar to dedicated readers, such as musings about hurricane threats, how to search for a golf home, as well as reviews of some of my favorite golf courses. For those who are targeting the Carolinas as a vacation or full-time destination, you should find a rich trove of new material. Check it out at Carolina Living. 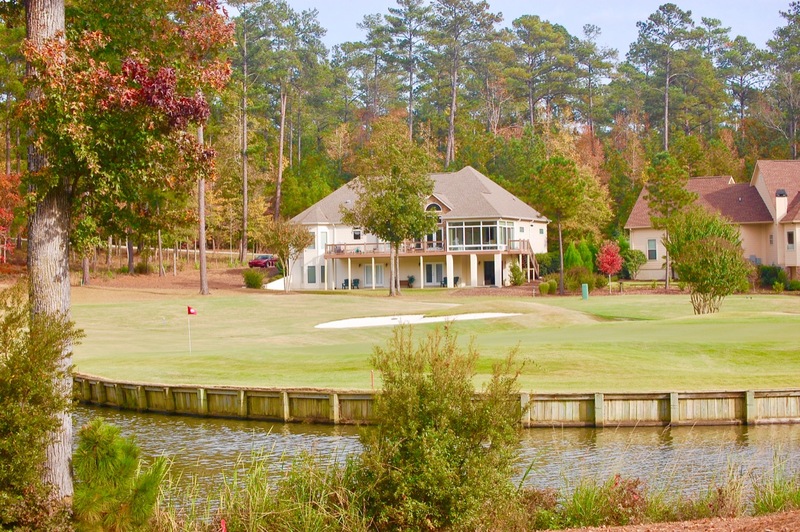 Cypress Landing, an under-rated golf community in Chocowinity, NC, about 20 minutes from the university town of Greenville. When Jack Nicklaus’ golf course design career was in its infancy, he developed a particular design quirk to call his own -– like Pete Dye’s railroad ties, or Tom Fazio’s cloverleaf bunkers and “buried” cart paths. For Nicklaus, it was trees in fairways. 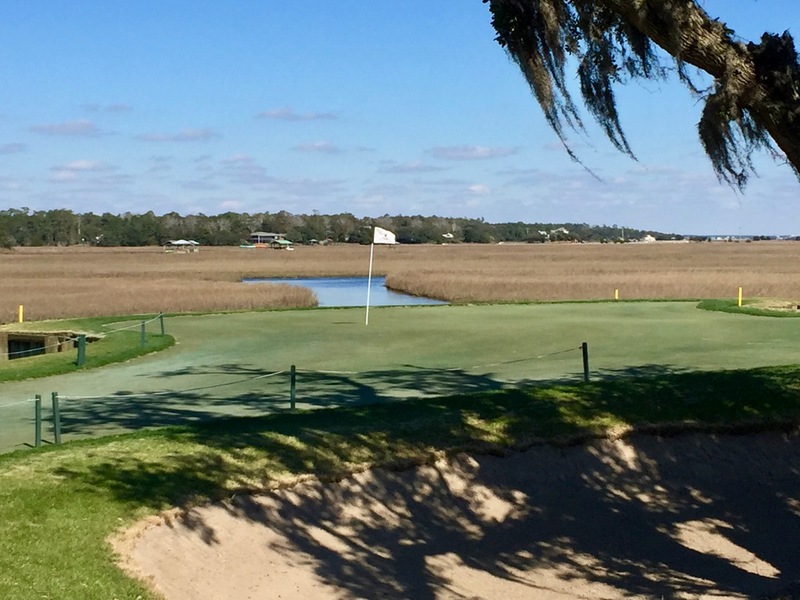 Nowhere was this quirkiness more in play -– literally and figuratively -– than at Pawleys Plantation, a semi-private layout in Pawleys Island, SC, that is a scoring challenge for newcomers and members alike. Whereas many designers punish tee shots that stray from the center lane of fairways, Nicklaus puts obstacles in the middle of the typically safe areas off the tee, forcing play to the edges. For example, on the par 5 4th hole, a string of three fair-sized bunkers split the fairway in two about 180 yards to 230 yards off the men’s tees. Using the fairway to the right of the bunkers provides the best angle for a long approach shot; a play to the left of the bunkers provides a shorter approach shot, but over a wide fairway bunker that extends all the way to greenside. But it is Nicklaus’ fairway trees at Pawleys that have been a constant thorn in the side of members and visiting golfers looking to at least shoot around par, once they subtract their handicap from their scores. Until two weeks ago, the tree in the middle of the fairway at #14 at Pawleys Plantation made players think about their tee shots. Not anymore. The tree was removed at designer Jack Nicklaus' recommendation. The first close encounter with a tree at Pawleys Plantation is on #5, a medium sized par 4 whose main feature is a large pond in front of the green. A well-smacked drive is required to leave a short, lofted iron approach to a typically firm green. But Nicklaus left a tall pine standing at the left edge of the fairway, and a perfect looking drive toward the middle can catch one of the tree’s branches, leaving almost 200 yards over the water to the tightly guarded green. The epitome of Nicklaus’ design idiosyncrasy is the sprawling and tall live oak at dead center of the 9th fairway that covers 60 percent of fairway. On the theory that a tree is 90 percent air, I typically try to fly my ball over, especially if I am playing the “executive” tees. That works out about half the time. The best play is either to the right of the tree, bringing rough and woods into play; or the narrower path to the left, where even more woods and a sprawling oak just to the left of the fairway may necessitate a pitch out to the middle of the fairway on the par 4. No matter the approach, the green is extremely difficult hit as it is the most elevated on the golf course and not very deep. Two weeks ago, after a visit and tour by Nicklaus in January of his 30-year-old course, workmen cut down a tree that was dead center on the par 5 14th hole. It wasn’t a huge tree, but it was about 10 to 20 yards beyond most good drives, and if you were behind it, you had no choice to skim a shot under its branches. Its position forced one to think about placement off the tee. Take it from a 20 year member at Pawleys Plantation: The Jack Nicklaus design is tougher than it appears, or says. A wide swatch of fairway to the right was the safe path but forced a layup shot over marsh. A shot to the left of the tree made for a shorter shot at an easier angle, but the cart path there and tight out of bounds along the edges of residents’ properties made a tee shot in that direction a fool’s paradise. Nicklaus admitted during his visit in January that he thought the golf course was too hard for even decent players, and he recommended that greens that had drifted away from bunkers be restored to their original sizes, that many of the fairway bunkers be grassed in and that “a copper nail” would be enough to fell the tree on 14. A few years ago, with Nicklaus’ affirmation, the club removed a couple of live oak trees that guarded the green at the long par 5 11th. (See my original article here. I don’t miss those trees, although they were a lot prettier than the solo tree on the 14th. But the latter tree’s demise, in my opinion, was a bad decision, an accommodation to those who felt punished after a self-described “good” drive ruined their prospects for a layup short of the green -- as if a shot straight down the middle of every fairway is always a good drive. Even excellent golf course designers aren’t always right. 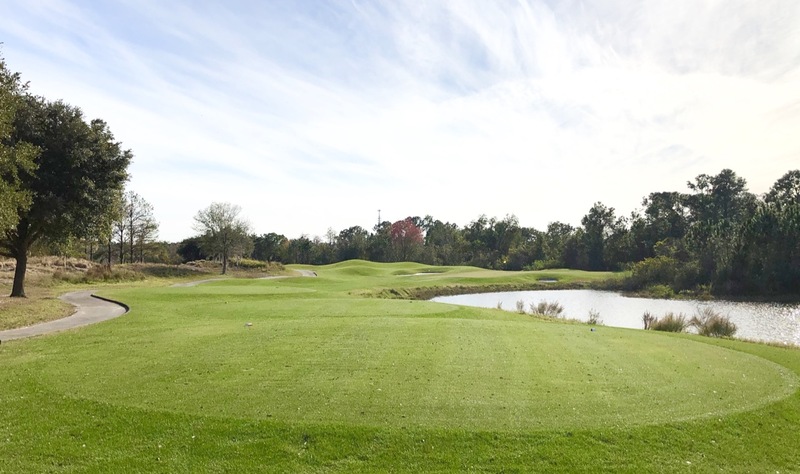 Water is featured on every hole at Harmony Preserve, although forced carries are rare. A mix of single-family homes and townhouses, with a “town center” section just inside the gates, the community was designed to overcome its remote location with a basic array of services on site; actually very basic in that the “center” is just two blocks wide. By the looks of it, Harmony’s target audience is independent-minded retirees desirous of an active retirement at a fair cost. 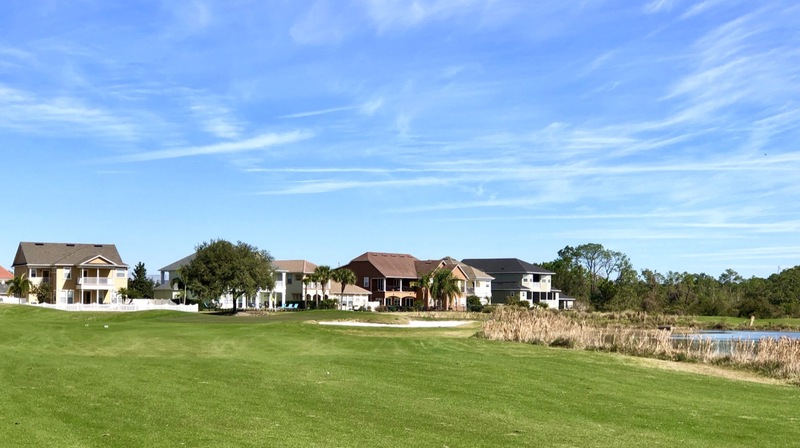 Homes start in the low $200s, and golf memberships are sharply priced beginning at $2,750 annually for as much golf as you want to play ($3,750 for unlimited play with a cart). You won’t do better than that at most nicely maintained golf clubs in Florida. What about the golf course? First of all, this is Florida and, therefore, don’t expect any dramatic contours from fairway to green that weren’t created by bulldozers. Those who want the occasional exercise of a good walk will find Harmony Preserve quite accommodating. Although there is a water feature on every hole, the fairways are quite generous; a few bunkers at greenside will give you pause as you prepare your approach shots. I found the greatest challenges of the golf course almost exclusively in the greens whose contours were sometimes obvious but, for the most part, subtle. This was my first round of the year, an excuse of sorts, but there is no excuse other than tricky greens for a half dozen three-putted greens. Homes in the Harmony Preserve community are, for the most part, sited close together, but prices start at very reasonable levels, in the low $200s. Golf membership pricing is a bargain too. I understand from other reviews of Harmony that alligators keep a wary eye on golfers during the warmer months. On the coldish day we played, we didn’t see a one. I was expecting a golf course that reflected Johnny Miller’s personality, or at least the one he’s expressed on air for the last three decades. But Harmony Preserve, while a perfectly enjoyable experience, lacked much drama (except on some of those greens). Miller, like former PGA stars Gary Player and Greg Norman, seemed to overcompensate in his design for Harmony. 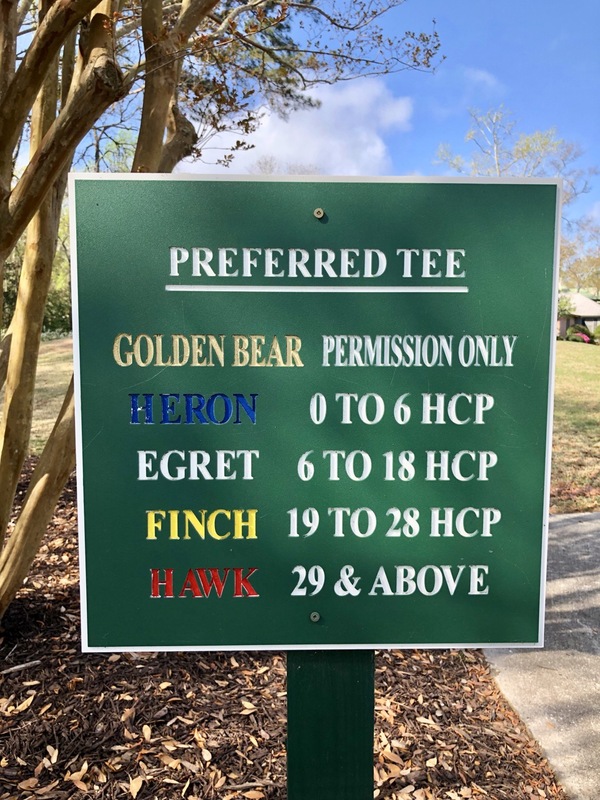 (Player’s layout for The Cliffs at Mountain Park and Norman’s at The Reserve in Pawleys Island, both in South Carolina, do not reflect the bravado of their personalities, or the make or break style of their golf games back in their heydays.) That is not criticism; all these golf courses, located in areas frequented by golfing retirees, may not reflect their artists’ personalities, but they certainly will please their audiences. If you would like more information on Harmony Preserve, or to arrange a visit, please contact us. We are in that season again, the one in which the mainstream media decides it has been a few months since they published its previous “golf is dead” article. The thesis always goes something like this: Golf courses are closing in record numbers because -- choose one or more of the following: a) a round of golf takes too long to play; b) young people (read “millennials”) are more interested in electronics than golf; c) the business model for a golf course/country club is flawed; you can’t make any money; or d) the pressure from developers to put houses where fairways once stood is too intense for flailing clubs to pass up. I know I am in the minority in believing golf does not need any structural changes – a round of 12 holes anyone? – to speed it up. My take is that it just needs players who are prepared to hit the ball as soon as their playing partners have hit; or we need to just chill out about the issue and understand that cutting a round of golf from 4 ½ hours to 4 means trimming less than two minutes per hole. Two minutes? Really? I am not sure which millennials disdain golf, but they aren’t those I know. Indeed, every year a millennial family friend heads to Myrtle Beach with a foursome of fellow millennials and asks me for golf course recommendations and dining options. They plan the following year’s trip right after the current one. My son, a millennial, and most of the junior and college golfers he competed against between 10 and 20 years ago, still play golf. Not all of them have made a career of golf, as Tim has, but they are still tightly connected to the game. No matter the season, Caledonia Golf & Fish Club in Pawleys Island, SC, is always in peak shape, and the clubhouse restaurant is among the best anywhere. If you think golf course operations is a bad business model, try getting a tee time most any morning of the year on the day you want to play at Caledonia Golf & Fish Club in Pawleys Island, SC. 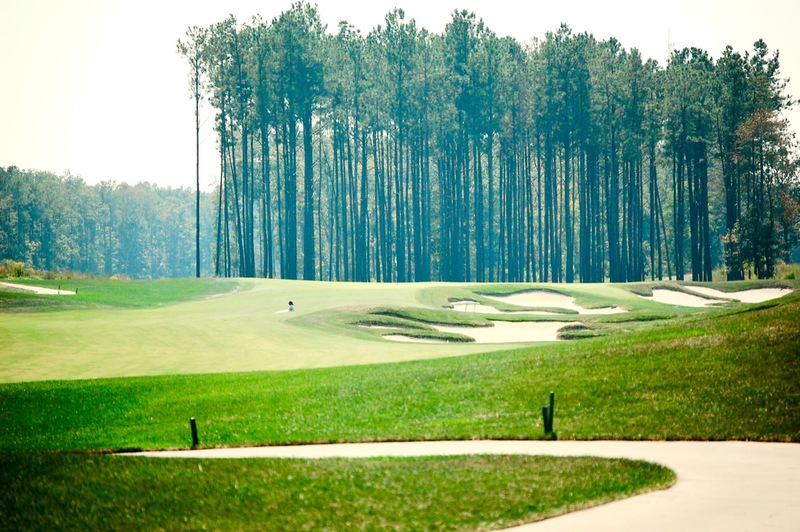 The secret to success at Caledonia, where green fees are at the high end of all those in Myrtle Beach, is care and imagination. The open-to-the-public golf course is always in peak private-club condition, the food in the restaurant is consistently outstanding, with views to match, and extra touches like the dispensing at the first tee of fish chowder on a cold fall morning are memorable. Golf courses that fail tend to do so in a way restaurants and other businesses fail -- with poor attention to quality and a general lack of marketing imagination. The good ones thrive. Housing developers covet golf courses for home construction because the landscape is already pretty much prepared for them, keeping costs to a minimum. 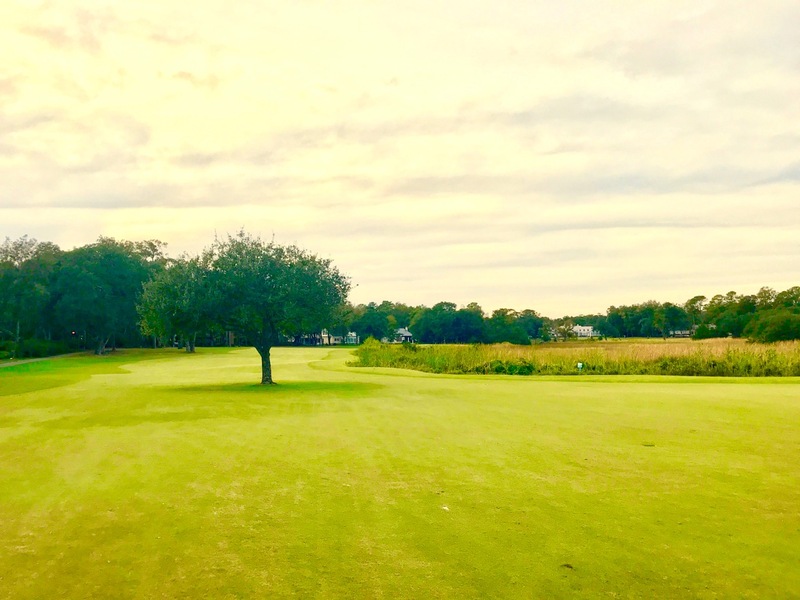 Across the country, residents and their lawyers are fighting back, and many are winning on the basis of a promise made by original developers that the golf course was a fundamental element of the community. Some original sales brochures that touted golf as the raison d’etre for the community have become Exhibit A in the attempt to convince courts that the implied contract to residents of a golf course supersedes a golf course owner’s right to sell his or her property to a developer. Overall, the issue of golf being under siege is overblown. Developers simply built too many golf courses in the 1980s and 1990s in order to sell houses (and sell a lifestyle dream as well). The number of golf courses will reach equilibrium with the number of golfers in the coming years. For the time being, we should consider it ironic that years after they used golf to sell homes, developers now want to build homes on those very same golf courses? This is less about any ebbing of golf’s popularity than it is about turning a quick buck. Golf courses will continue to close until their numbers are appropriate to the number of golfers with the time and desire to play a couple or three times a week. Here’s hoping that happens in the next few years; I am tired of dopey newspaper articles. You probably can’t find two more unrelated topics than timeshare ownership and healthcare, unless you believe that stress can cause many health issues and timeshare ownership, according to those who know best, can cause stress. No shrinking violets, we, this month’s Home On The Course newsletter tackles both issues from a basically personal point of view. Yes, I think about the conseauences of living in South Carolina away from doctors in Connecticut who follow up with me on past major surgeries and, yes, spoiler alert – gulp – my wife and I just bought into a timeshare – although I hasten to add we don’t consider it really a timeshare. In any case, we accepted an offer we could have refused. You can learn how and why by signing up to subscribe to Home On The Course. It’s easy and it’s free – especially of stress. Click here now and the newsletter will arrive in your inbox in the next day or two.